Just mentioning the word “drone” conjures up all types of reactions these days. Originally a name that was given to high-altitude, unmanned military aircraft, the popular term has come to define almost any Unmanned Aerial Vehicle (UAV), or Unmanned Aerial System (UAS). Many of these smaller radio controlled flying robots are now being used by hobbyists, farmers, scientists, and cinematographers, and have nothing to do with military operations. Unfortunately, these personal sized unmanned aircraft are being perceived in the public as being a safety and security concern. Fueling the misguided perception of “drones” is the rapid advance of UAV technology. Only a few short years ago, the non-military applications were limited to hobbyists, many of whom were model airplane and helicopter enthusiast and designers. These hobbyists began to utilize some of the same hi-tech advances already used in smart phones, such as GPS systems, accelerometers, digital compasses, and barometric altimeters. As the technology became smaller, more accessible, and more affordable, personal UAV usage literally took off. The unmanned vehicle industry really accelerated when it became possible to mount cameras to the flying vehicles. GoPro cameras were small and light, and were easily outfitted to these systems. But it was the self stabilizing camera gimbal, with 3 axis control, that completely changed the potential and degree of quality available with these devices. Designers soon found ways to mount larger DSLRs and professional video cameras to even larger multirotors. Almost overnight, a new era in aerial photography was born. Angles and images previously considered nearly impossible without manned aircraft were now available to almost everyone. The UAVs used in photography and cinematography continue to push new boundaries. These unmanned aircraft have evolved from single rotor helicopter systems to multi-rotor machines, in just a couple of years, with rapidly increasing sophistication every year. Many of the smaller camera mountable systems are designed to be affordable for amateurs. For example, DJI of China was one of the first companies to design inexpensive “quadcopter” machines that could easily carry a gimbal stabilized GoPro camera. These four rotor vehicles can capture images that are deemed “good enough” for many television outlets. As large market television and the cinema industry began to take notice, the race was on to fly bigger, sharper, heavier cameras. In order to fly these higher quality cameras, bigger UAVs were needed, typically employing six to eight rotors or more. Highly technical, precision gimbal designs were created to achieve smoother, more cinematic shots. These new unmanned helicopters are designed with such technological complexity to require a team of two or more to both fly the aircraft and capture the images. Currently, the only limiting factor as to which camera to fly is weight. The popular RED Epic or Dragon, with a quality cinema prime lens, will come close to tipping the scales as far as payload capacity is concerned. However, this is rapidly changing and there are currently some prototypes capable of carrying an Arri Alexa sized rig. Most common cameras used for television broadcast and commercials, other than the RED, are the Canon 5d Mk3, Blackmagic Pocket Cinema Camera, Panasonic GH3 and Panasonic GH4, to name a few. Some gimbals are built to such precise tolerances that it may only carry one camera model and one specific lens. Flying UAVs has become an increasingly advanced skill in the world of aerial cinematography. Using a radio controller with two joy sticks to command movement of a UAV- those who spent a good deal of time as a PC gamer would typically have sufficient skills to quickly learn to fly small multi-rotor systems. Built in auto-pilot software allows amateur “pilots” to master skills that might have taken many years in the past. Larger systems involving six to eight rotors takes more time to master, though many of the same skills involving smaller UAVs are transferable. Once up in the air, UAVs can capture images that previously required manned aircraft, and in some cases, images that were previously almost impossible. For instance, a UAV can fly straight up and over the side of a building, getting breathtaking images that would be too dangerous to get with a manned helicopter. This agility opens up unlimited location opportunities that were previously untapped. In the hands of a skilled camera operator, these unmanned aircraft can capture cinema quality images at a fraction of the previous cost. Shots involving low altitude, overhead perspective, landscape, and difficult angles can all be achieved with UAVs. Because new gimbals allow multidirectional stabilization and control, its possible to get clean, sharp, steady images taking the camera beyond the capabilities of cranes and dollies. It is best to think of these aerial devices in the same way one would any other camera platform in the film and television industry. It is a tool used to mount and transport the camera. An experienced aerial cinematography team will work in concert with one another, and with the producer or director, to achieve the vision of shot. It’s also important to remember that experience matters when hiring for aerial crews. Multi rotor vehicles present certain safety concerns, and even an unexpected gust of wind can sometimes produce challenges. “Auto-pilot” programs are designed into these aircraft, which makes takeoff and landing easier, but challenging situations and environments require many hours of practice, expertise and preparation for unexpected circumstances. When working on a set with other people, the inexperienced pilots are not only putting gear at potential risk, but people as well. When seeking cinematic, quality images, it’s important to consider flying safety, as well as the skill level of the DP and pilot. The FAA is working to regulate UAVs, which may slow the growth and innovation in this new industry. However, much of the talk in the media is based in fear rather than understanding. Many UAV cinematographers have found strong interest from companies seeking aerial footage from this new perspective, and we are likely to see more and more applications in TV commercials, sporting events, documentaries, and news to come. The drive to utilize the potential for these systems in other venues, such as agriculture, science, and search and rescue, should help to allay unreasonable fears in the future. Virtual Image Productions employs several different UAV systems, including 4, 6, and 8 rotor vehicles capable of carrying everything from a GoPro to a RED Epic. 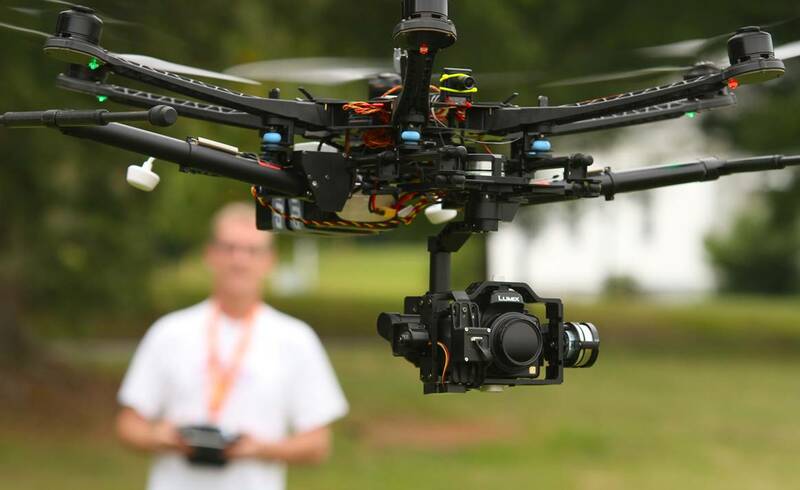 The “hexacopter”, six rotor system easily carries DSLR setups, which are now outfitted with outstanding HD and 4k video capabilities and are often sufficient for most customers. Most of our work involves broadcast TV shows, commercials and documentaries. The sky is no longer the limit when it comes to capturing outstanding, breathtaking images.